Starting today, we’ll be blogging the “12 Days of Fishmas.” Each day we’ll feature a different species that you can see during your visit to Birch Aquarium at Scripps. Love this species? Consider our Adopt-A-Fish program and help us keep these animals thriving! A sardine is a slender fish with bluish to dark green coloring on its dorsal (top) side and a light-colored, silvery belly. This “counter shading” helps camouflage the sardine from predators above because they blend into the ocean bottom and from those below who think they only see sparkling sky. Sardines grow up to about 15 inches. The maximum published weight for a sardine is 1.1 pounds, and the oldest known Pacific sardine was recorded to be 25 years old. Sardines are filter feeders, meaning they swim with their huge mouths open in order to consume pieces of plankton (tiny floating plants and animals). They’re also a favorite meal for many ocean predators such as marine mammals, birds, fish and, of course, humans. Sardines play an important role in the pelagic (open ocean) ecosystem. They are also a best choice for your environmentally sensitive dinner plate, according to the Monterey Bay Aquarium Seafood Watch program. Studies indicate that sardines have been around for more than 7,000 years. Sediment core samples taken from the Santa Barbara Basin indicate wide variations of populations over that time, with occurrences of declines and recoveries averaging about 36 and 30 years, respectively. In more recent history, Pacific sardines supported a major fishery off California’s shores, with peak yearly catches of 1 billion pounds in the 1930s. However, stocks unexpectedly and inexplicably plummeted in the 1940s, and the entire commercial fishery collapsed in the early 1950s. Populations never recovered their heyday high. Scientists at Scripps Institution of Oceanography began working immediately to solve this mystery, which led to the formation of The California Cooperative Oceanic Fisheries Investigations (CalCOFI), which now studies all marine ecosystems off California and the management of its fisheries resources. In 2006, Scripps scientist George Sugihara attributed the sardine collapse to harvesting too many large fish, a practice that leaves behind predominantly juvenile populations, which are unstable and extremely vulnerable to even minute shifts in the environment. Two years later, Ryan Rykaczewski and David Checkley – another pair of Scripps scientists – hypothesized that wind patterns were to blame for the collapse. 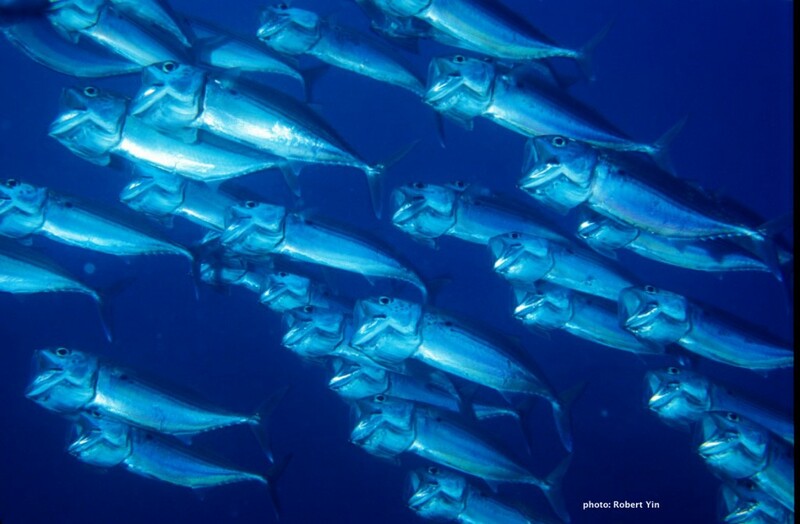 Their research showed that wind drives ocean upwelling, which brings nutrients to surface waters, allowing sardines and anchovies to thrive. When winds are strong enough to accelerate upwelling, populations flourish, and the opposite is true when wind conditions change and nutrients dwindle. Sardines were named after the Mediterranean island of Sardinia, where the species was once found in abundance. Most fish have a faintly visible lateral line on each of their sides – running from the operculum (boney part that protects the gills) to the base of the tail – that is actually a sensory organ used to detect movement and vibration in the water around them. Sardines don’t have this line but do have pressure-sensing pores on the head that aid in schooling behavior. Our school of sardines live in a large, circular tank at the entrance to the Hall of Fishes. As representatives of Birch Aquarium’s connection to Scripps Institution of Oceanography, they remind visitors every day that the ocean is a wild, wonderful, and mysterious place! Sardines are just a few of the 3,000 fish and invertebrates that thrive at Birch Aquarium. By adopting one today, you can be part of the team that provides essential care to these special ocean inhabitants. Find out more about the Aquarium’s Adopt-a-Fish program.